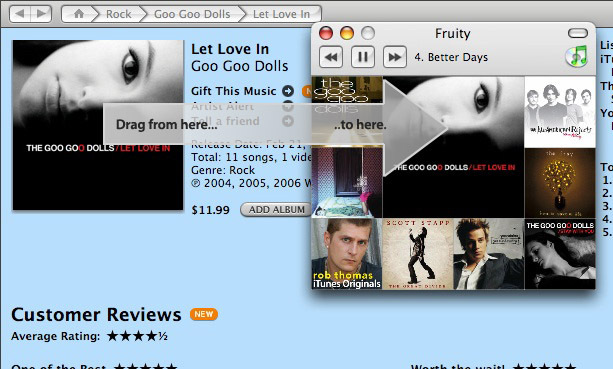 Fruity is an fresh alternative way to browse the iTunes Music Store. By dragging any link from the iTunes Music Store into Fruity, you will have access to a continuous sample of the album. In addition to that, it will seek out all the albums that are related to the one you're listening to. You can also copy and paste links from iTunes if you're not dextrous with your mouse. Requires Mac OS X 10.4. It is freeware. Drag (or copy and paste) any link from the iTunes Music Store to the application and it will automatically start playing. There are buttons to skip forward or back and the ability to pause. The button on the bottom right jumps you to iTunes page for the sample you are listening to. Added extracting artwork and sample url. Stop playing album from being listed again as a related one. Changed to a unified toolbar rather than ugly custom overlaid buttons. Deals with playlists with PDFs files better. Allowing some other iTunes URLs I forgot about. Fruity was created by Alastair Tse.